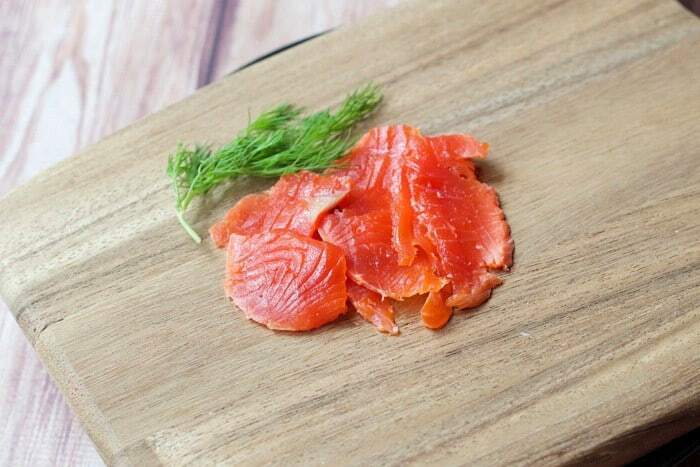 Homemade gravlax is the perfect topping for your weekend bagels, salads, and sandwiches. One of the most well-known foods associated with Swedish cuisine is gravlax, salmon that is cured in a sugar-salt mixture. It’s a common topping for open-faced sandwiches, added to salads, or even eaten alone. Instead of being smoked, the sugar and salt cure it, and often dill or other herbs are added. Some recipes even call for a basting of aquavit on the salmon. It was only fitting that I include gravlax in my julbord series! I had been meaning to make gravlax for a long time, and I was surprised how easy it actually was. The hardest thing was actually finding enough room in my refrigerator for the dish it was resting in! You can choose any kind of salmon for gravlax, though I decided on sockeye, which is a bit leaner than some of the other varieties like king (it’s also a lot cheaper). You’ll want to have two pieces that are about equal size and thickness, so feel free to ask your fishmonger for slices off two different filets rather than getting one larger filet. Having equal-size pieces will help ensure the flavor develops evenly throughout the salmon, rather than a tougher, more strongly flavored thin section sandwich under a thick section. The easiest way to prepare the salmon for the cure is to line a rimmed pan (I used a casserole) with plastic wrap, then place your salmon pieces side-by-side inside. After you sprinkle on the salt and sugar and lay on the lemon and dill, you just bring up one side of the plastic wrap to sandwich the two pieces together, and then wrap it tightly. This method reduces the amount of mess, which I know we can all appreciate. Don’t forget that you must keep the salmon in a rimmed container while it cures — excess liquid is released during the process and you need a place to catch those drippings. You don’t want it to be the bottom of your refrigerator! Not all recipes call for citrus, but I decided to use lemon in mine for an added level of brightness. You can go without if you like, and the dill flavor will be more pronounced instead. Once the gravlax is ready after about 48 hours (it will look somewhat dry on top and darker in color), remove the dill and lemon and slice the salmon thinly, against the grain. Serve it with bagels, cream cheese, and red onion, or on crisp crackers with some sour cream and dill. It will keep for about five days in the refrigerator. Cut salmon into two equal pieces and make sure pin bones are removed. Line a rimmed pan with plastic wrap and place salmon side-by-side on plastic wrap. Mix together sugar and salt and sprinkle evenly over both salmon pieces. Lay lemon slices across the salmon, then arrange dill, thick stems removed, on top. Lift up one end of the plastic wrap and fold over salmon to sandwich it onto the other half. Wrap salmon tightly. Place in the refrigerator, preferably with a heavy container placed on top of the salmon to help extract the liquid. Let rest for 48 hours, then remove from refrigerator and unwrap carefully, minding the juices that will leak out. Discard the dill and lemon and slice the gravlax thinly with a very sharp knife. For more tasty inspiration, check out my A Taste of Sweden board on Pinterest! Follow Megan Myers | Stetted’s board A Taste of Sweden on Pinterest.